During early development, every human being is exposed to the relative impact of relational trauma – disconfirmation of aspects of oneself as having legitimate existence in the world of others – in shaping both the capacity for spontaneous human relatedness and the relative vulnerability to "adult-onset trauma." 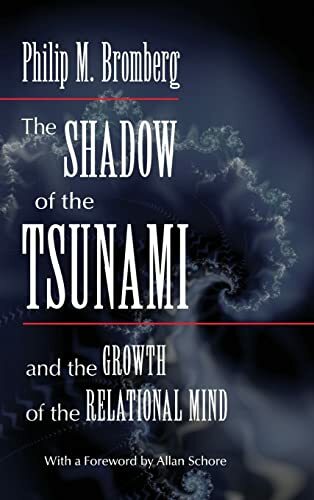 To one degree or another, a wave of dysregulated affect – a dissociated "tsunami" – hits the immature mind, and if left relationally unprocessed leaves a fearful shadow that weakens future ability to regulate affect in an interpersonal context and reduces the capacity to trust, sometimes even experience, authentic human discourse. In his fascinating third book, Philip Bromberg deepens his inquiry into the nature of what is therapeutic about the therapeutic relationship: its capacity to move the psychoanalytic process along a path that, bit by bit, shrinks a patient's vulnerability to the pursuing shadow of affective destabilization while simultaneously increasing intersubjectivity. What takes places along this path does not happen because "this" led to "that," but because the path is its own destination – a joint achievement that underlies what is termed in the subtitle "the growth of the relational mind." Expanding the self-state perspective of Standing in the Spaces (1998) and Awakening the Dreamer (2006), Bromberg explores what he holds to be the two nonlinear but interlocking rewards of successful treatment – healing and growth. The psychoanalytic relationship is illuminated not as a medium for treating an illness but as an opportunity for two human beings to live together in the affectively enacted shadow of the past, allowing it to be cognitively symbolized by new cocreated experience that is processed by thought and language – freeing the patient's natural capacity to feel trust and joy as part of an enduring regulatory stability that permits life to be lived with creativity, love, interpersonal spontaneity, and a greater sense of meaning.